When you drive at night, you can face added challenges because of “decreased visual distance and sensitivity to the contrast between darkness and bright lights along roadways.” In other words, it isn’t as easy to see during nighttime driving! As we age, Lenscrafters.com explains, our pupils shrink and don’t dilate as fast as they once did. So, less light reaches our retinas, which makes it harder to see at night. This can be called “night blindness,” and it can make driving in your 50s, 60s and beyond more stressful. To help, we’ll share five tips that focus on helping older adults when driving after dark. That way, your doctor can make it as easy as possible, given your vision, to manage differences in how you can see in the daytime versus the nighttime. Your eye doctor may be able to help you see fewer halos around lights and otherwise do what’s possible to make nighttime driving easier for you. When this can work, it’s the simplest solution of all. Do your grocery shopping and schedule appointments, for example, in the daytime. Meet friends for lunch rather than for dinner. Although it may not always be possible to avoid driving at night, when you can, do so and you’ll probably be pleasantly surprised by how much this reduces stress. According to SeniorDrivingAAA.com, it’s important for older drivers to appropriately manage driving speed. That way, you’ll be less likely to find yourself in a situation where you can’t stop for an obstacle that you can see within your car’s headlight range. Also, while driving after dark, increase the distance between your vehicle and the one in front of you so you have at least four seconds of reaction time. When your eyes are continually exposed to glare, whether from sunlight or car headlights, this can lead to eye strain. So, when days are sunny and bright, wear quality sunglasses and then remove them when the sun goes down. If you’ve been driving a while in the daytime, take a break before you attempt nighttime driving. And, if you are driving at night, use the painted edge lines on the roads and the center of the road as guidelines. In fact, according to the American Academy of Ophthalmology, these glasses may actually make it harder to see at night. These glasses are being marketed as ones that can reduce glare, but the tinted lenses really reduce the amount of light getting to your eyes; thus, the concern. 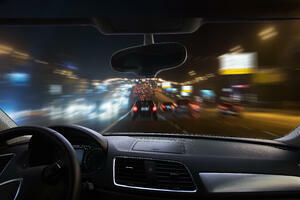 During nighttime driving, you need to be careful whenever you limit the light in low-light conditions.